The Bulls are off to Toledo, who we split a series with at the beginning of the month. The last time we took a look at this chart (Game 55), we were 15 games above .500. 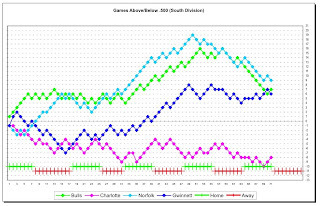 Now, after the awful slide of recent weeks, we’re at 7 above .500 (39-32), still leading in the wild card, still behind Norfolk, and just slightly ahead of Gwinnett. Scranton still leads in the North (41-27) and Louisville (38-32) leads in the West. The Bulls team ERA has grown to 3.89 and we’ve slipped from 5th to 7th in the league. The team batting average (.258) is, oddly, unchanged and we’ve gone from 9th back up to 4th. Our team OPS dropped slightly to .732 from .752. Only one of our batters (Henry Mateo) is above .300. Mateo also leads the team in OBA and OPS. Odd for a second baseman. On the trip we will also be playing Columbus, who we saw at the DBAP in April and split a series with. If they are anything like the Bulls, they will have had a lot of turnover in their roster as well. I’m hoping that Chris Richard and Mitch Talbot get off the DL during the trip, but I haven’t heard anything about them recently. If this trip goes true to form, a lot of roster changes will come down while they roam about the midwest. I’ll do my best to keep you informed. Shouldn't be long for Chris Richard - spoke to him last night and he said he was getting better. What was with the music for Justin last night? Culture Club and boy George? Weber was cracking up while in the on deck circle! I think someone was trying to keep them loose - looks like it worked. See Adam Sobsey's story at link in the "Bulls Win" post below to learn about the music. He went on about it quite a bit. Most of which doesn't make sense to a cranky old guy like me ... I mean I can recognize the Dylan, Mellencamp, and Nelson stuff ... That's my generation (scary thought, that). Whatever it takes. It seems to have worked. Great news about Chris. I'm guessing that the he came back too soon and stressed it that one game he dh'd and had to run something out. Were you there (think it was last season) when they put the oompah-loompah song on when Weber came up to bat? Classic, classic baseball. With Hughes playing the way he has been, the Bulls havent missed much of Richard.